I usually drive to Montréal to report stories. Today — with a foodie experience at the Montréal en Lumière festival awaiting me up north — I figured it would be both relaxing and productive to take the bus instead. I rushed from work to catch the 12:01 from the Greyhound terminal at Burlington Airport, huffing and puffing my way into a seat just before the scheduled departure time. About 10 minutes later, a Greyhound rep stepped onto the bus with an announcement. "We do not have a driver for this bus. You will have to wait for the 3:35," she told us. The other passengers immediately erupted with tremendous passion. "No! No! No!" one woman shouted repeatedly, her o's clipped in the French way and her hands cutting the air. "No! You need to find a driver!" yelled the woman behind me, while others echoed her. "You need to find a driver! This is outrageous!" shouted the man across the aisle. A three-hour wait was certainly a nuisance, I thought, but the deep upset among the passengers was almost shocking. They continued to shout for a full minute until the rep — her face set in stone — curtly told them, "If you want to talk to me anymore, you can come inside. But I will not be shouted at." Turns out, many of the 15 or so passengers on the bus had boarded in Boston around 11 p.m. the previous night. They arrived in White River Junction on time around 2 a.m., when their driver got off the bus — and never came back. A rep there told the passengers they would have to wait until the next morning to leave. The bus' door was left wide open, some of the passengers told me, so that they had to hunker down in their seats to stay warm. They had been scheduled to arrive in Montréal at 6:45 a.m., but the bus didn't pull out of White River until 10 a.m. the next morning. Thirteen hours after they first boarded in Boston, they were weary, angry and dumbfounded, and they refused to leave the bus, thinking they might get stranded for good. Frances Green, a teacher who lives in Montréal, wondered aloud if she would still have a job when she finally gets home — she missed work today. Another, student Natalia Bustamante, will miss an important 3 p.m. exam at the University of Montréal. "Call the Burlington news! Call the television stations!" thundered Green. Someone wondered aloud, "Should we call 911?" I discouraged this, admitted I was a reporter — albeit a food writer at a local weekly — and called WCAX on their behalf. WCAX reporter Gina Bullard arrived 20 minutes later and interviewed a string of passengers who suddenly seemed more timid in front of a camera. 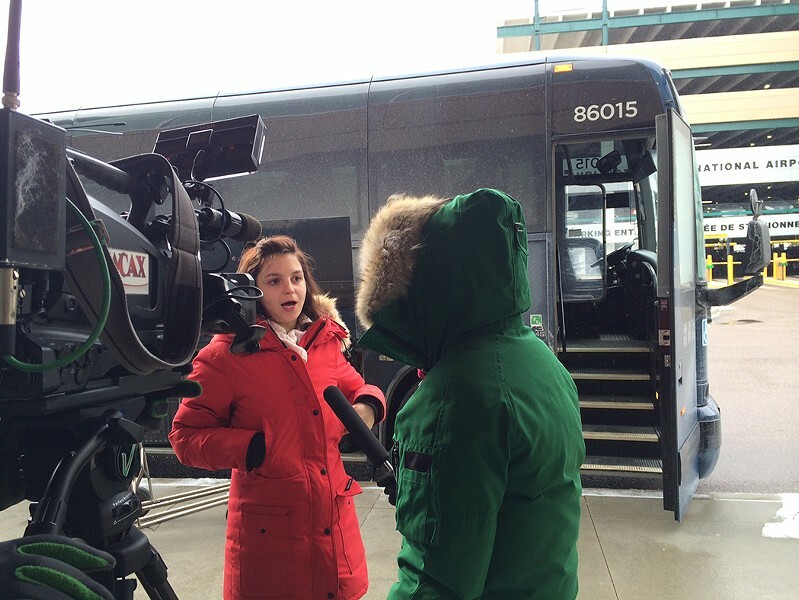 Green debated whether she should talk to the press, afraid she might be barred from getting back on the 3:35 p.m. bus. A police officer arrived to keep the peace. 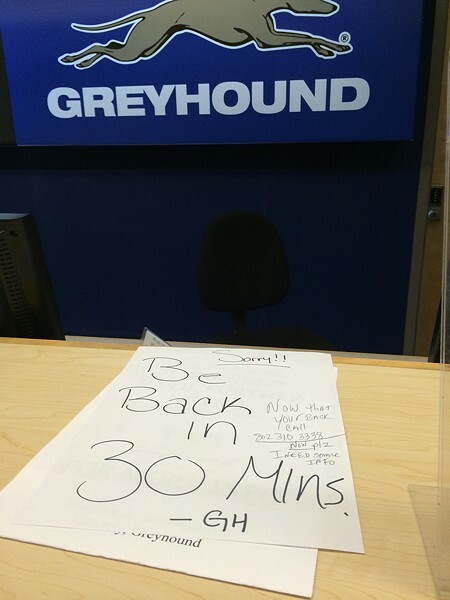 Inside the terminal, the Greyhound desk was left empty for close to 45 minutes with a sign that said "Be back in 30 mins." When rep Carol Anderson appeared back at the desk, she dealt with the angry crowd briskly and efficiently — assuring everyone that they "definitely" had a seat on the 3:35 p.m. bus, unless they continued to shout at her. Many people looked skeptical that another driver would show up, and contemplated banding together to rent a car. In the meantime, I'm about to drive to Montréal, a few "bus refugees" (and new acquaintances) in tow — and count this as my first, and last, run-in with Greyhound. After 90 minutes, Burlington Airport personnel hatched a plan to charter a private bus to ferry the stranded passengers to Montréal — news that immediately calmed flaring tempers. WTF: What's the Story Behind the 'Angry Birds' Buses?